Royal Artillery 152 Bty., 51 Lt. A.A. Regt. Son of George John and Emma Evelyn Jenkins. Mother Emma Warren married George John Jenkins in 1909 and John Edward was born in 1911 in Tottenham. The father's occupation was something to do with making scientific instruments. Husband of Violet Gertie Jenkins, of Banstead, Surrey. Grave Reference: 10. H. 4. Don't know his wife's maiden name so can't check through that way. There are several Jenkins in the phone book but non are a definite fit. Just post war there was a Mrs V Jenkins but in Wallington but with Vera, Violet, Veronica etc so may not be his widow. 1933 Leonard Jenkins was in Tadworth. 1954 H Jenkins was a greengrocer at Tattenham Corner. 1954 John C Jenkins was in Parsonsfield Rd Banstead. 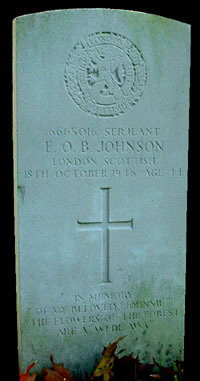 Edward Osbourne Bisset Johnson was born in Solihull in 1902. Son of Edward Henry and Jeannie Isabella Clark Johnson. Husband of Dorothy Bissett Johnson, of Banstead. Grave Reference: S.E. of Church. Family research by Barbara Rough - Could only trace birth record. Son of Derek and Florence Johnson. 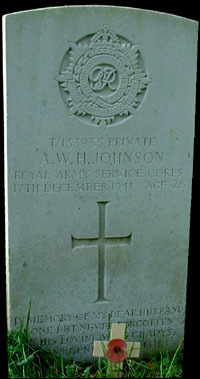 Husband of Gladys Lillian Johnson, of Pallion, Sunderland, Co. Durham. Grave location: North of Tower. With Barbara Rough 10 Jan 2007 - Unable to find any family records.